That's right, today is Book Lovers Day, and you know the Free Library wouldn’t miss the chance to celebrate! In honor of such a momentous occasion, our staff shared what a perfect day of reading looks like to them, and we're inspired! 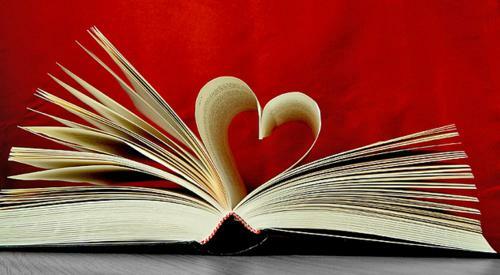 Here’s to a marvelous day of celebrating our favorite pastime and the books we love! "My dream reading scenario is reading a paperback book on the couch with my legs up, a hot cup of tea, and a blanket. It’s even better if it’s a rainy weekend day when I have no plans and can stay there the entire day." "Whether it’s a romance hero I’m swooning over, or a middle-grade novel I’m laughing at, I love getting lost in a good book, so I like my surroundings to be distraction-free. Give me a comfortable chair, a cup of coffee, and no one around for miles (or at least not too close!). However, my favorite part about reading is then sharing my love of it with someone else." "My dream reading scenario is having a quiet seat near a window and a cup of coffee (AM) or glass of wine (PM) and NO 5 YEAR OLDS INTERRUPTING ME!" "I’m on a padded rocking chair with an ottoman on the porch of a cabin in the mountains, looking into the woods or out over a broad creek on an evening in the summer. In my hands: a book of poems, my mechanical pencil – to underline the most striking lines – and two fingers of bourbon (Woodford Reserve, if I’m the luckiest) with two cubes of ice." "I love to read at home on the couch with my dog and cat snuggled up on my lap!" "I guess my dream reading scenario would just be a quiet place, a comfy chair, a cup of coffee, and an engaging and engrossing read, whether it’s fiction, biography, history, or even a graphic novel. I’d definitely be reading a physical book, so I wouldn’t be distracted to click away and start looking/reading/watching something else. The best types of books, in my opinion, take you someplace else entirely and kind of close off the outside world, at least for a little bit. Reading, for me, is not only entertainment, but also an escape and hopefully discovery of something new." "I dream of curling up on a super comfy couch with a good book — without question in print, preferably paperback. Reading in winter is the best, because then I can be under a blanket and sip from a giant mug of hot chocolate. Extra points if I can see something nice out the window!" "The key to happiness is comprised of three simple things: a book, coffee, and breakfast food. Find yourself a diner, take a seat at the counter with a good book and an hour or so to spare. In this scenario, I find e-books work best to avoid staining your library books with the copious amounts of ketchup you should be applying to your eggs and home fries." "I’d love to be flipping through the pages of a novel in a warm coffee shop in the city, on a cloudy fall day, sipping from a fancy, delicious (most likely over-priced) espresso drink. I’d be sitting by a window because I’ve always preferred reading by natural light. Despite the buzz of conversation of the shop’s patrons and the outside noise of the city, I could escape into the story for a while—it’s nice to be reminded that you can comfortably slip into a different world even when there’s so much going on around you." "My dream reading scenario is easy because it actually happened. When my second child, Asha, was born in the chilly fall of 2005, I spent most of my three-week paternity leave lying in front of the wood stove reading the big omnibus edition of all three Lord of the Rings novels with an eight-pound love bomb snoozing on my chest. Definitely the best reading experience I’ve ever had (and I don’t even really like fantasy books)!" "Curled up in bed with my Kindle, reading an awesome science fiction novel, probably a Star Trek: The Next Generation book. As I gently fall asleep, the book seeps into my dream and I’m working on the bridge of the Enterprise." "On a beach (anywhere), either early in the morning or just before sunset. It’s hot, but not too hot, and there’s a sandy, salty breeze coming off the ocean. Preferably some place secluded with little to no people. I take up camp underneath a tropical thatch with a fruity cocktail by my side. I enjoy paperbacks rather than an ebook. I feel extremely accomplished when I finish a book and It goes up on my bookshelf – and it’s a great escape from technology." Need more inspiration? Find something wonderful in our catalog and get reading! Let us know in the comments: What's YOUR dream reading scenario? Isn't every day Book Lovers Day? !